This is something I have wanted to write for a while, but never took the time to do it. I have browsed the Tumblrs Working at a Nonprofit, and Nonprofit Problems a couple of times, and have actually laughed out loud. Though not all of the things on there are relevant to my workplace (I find that working in the arts is much different than other non-profit sectors), I can totally relate to them. 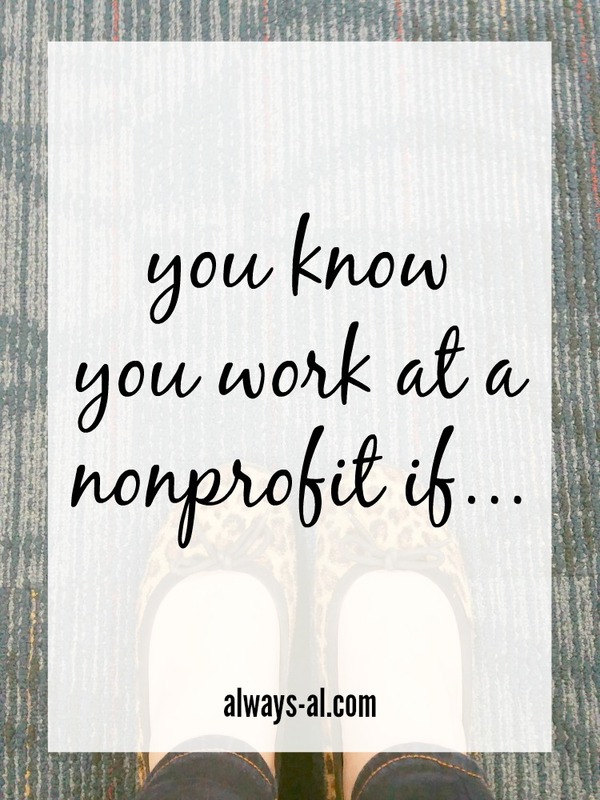 With the help of my co-workers and friends, I put together a list of ways you know that you work at a nonprofit. This makes me laugh. When someone leaves their job, the whole office scavenges their office supplies, since we didn’t have it in the budget to make an order last month. You work the weirdest hours, and sometimes people ask if you have two jobs. Nope, just on that nonprofit work schedule. You might walk a 5k every day at work. But what is a 401k? Every day is casual Friday, unless you have a planned meeting, or board members are coming in for some reason. Did you want to go on vacation at a certain time? Nope. All vacations must be taken in the short stretch that is the “less busy” season. You spend hours upon hours preparing a board packet for a meeting, only for it to be read by 0 to 3 people. Someone just used the last roll of toilet tissue from the last order, so we all bring some from home until the next order comes in. Number 8 also applies to coffee creamer and copy paper. Your diet consists largely of leftover donor cheese and previously opened bottles of wine. You have a great sense of passion, satisfaction and fulfillment from your job. The days may be long and the pay may be low, but you are doing work that you truly believe in.